Chemicals and fracking giant Ineos rejected the advice of UK security services and refused to pay for measures to protect its refinery at Grangemouth from a terrorist attack, an Unearthed investigation has found. Confidential government documents obtained by Unearthed reveal how Ineos rejected security recommendations made by the Centre for the Protection of National Infrastructure (CPNI) – an agency accountable to MI5 – arguing that they were unaffordable and would not benefit the company financially. The news comes after Ineos struck a £199m deal with BP last month to purchase the Forties pipeline system – one of the UK’s most strategically important pieces of infrastructure – which brings North Sea oil to the Grangemouth complex. According to one briefing document drafted by officials: “Ineos has explained that it is not prepared to undertake any of these mitigations because it cannot afford to do so and, even if it could afford this expenditure, it does not see itself as the beneficiary of the enhancements proposed”. Ineos is also reported to have said that if the UK and Scottish governments wanted to improve counter-terrorism security at Grangemouth they should pay for it themselves. The documents date back to late 2010 and 2011 when Moira Wallace – then permanent secretary at the department for energy – was due to meet with Ineos at Grangemouth to discuss the problem. When contacted by Unearthed, Ineos was unable or unwilling to confirm whether or not it had subsequently taken the advice of security services to fund the counter-terrorism measures. The firm said that safety and security at its sites is a top priority. 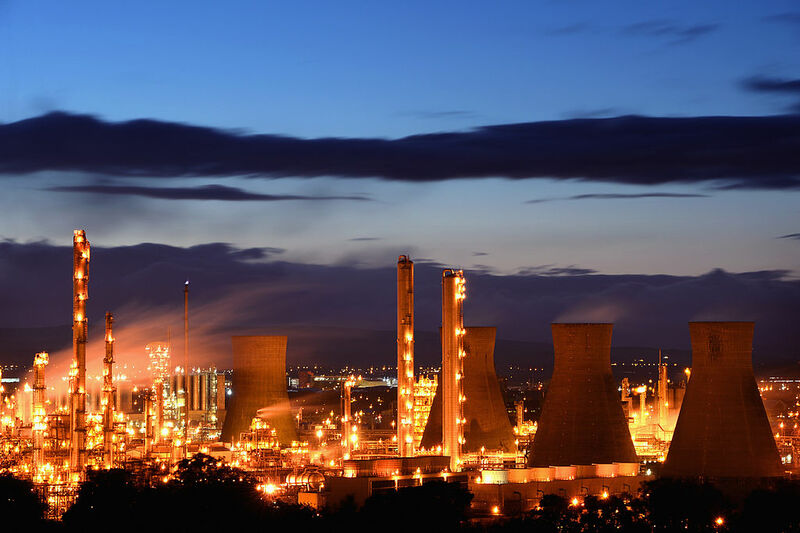 Ineos is one of the world’s largest manufacturers of chemical products and holds the most licences to explore for shale gas in the UK – covering 1.2 million acres of England. Its Grangemouth chemicals plant forms part of a massive refinery complex containing three sites classified as critical national infrastructure (CNI) – the loss of which would have severe short and medium term impacts for the UK. In addition to Ineos’ refinery, the complex contains the Forties pipeline and an oil and gas processing plant. The documents reveal concern in Whitehall that the weaknesses identified in Ineos’ security could expose these other sites to terrorist attack – risking a loss of gas supplies equivalent to 14% of UK demand. The briefings also reveal that Ineos was the first owner of critical national infrastructure ever to have refused the advice of the CPNI, prompting the government to consider how it could force the company to pay. The documents consist of two confidential security briefings written by officials at the department for energy and climate change (DECC) – now rolled into the department for business, energy and industrial strategy (BEIS). View the original documents here and the redaction-free version here. The department works with the CPNI to protect the UK’s energy infrastructure. The agency is accountable to the director general of MI5 and operates under the Security Service Act 1989. The three critical national infrastructure sites at Grangemouth are classified as Category 4 assets – 5 being the highest. Ineos’ refinery is considered to be Category 4 in part because of its interdependence with the Forties pipeline and BP oil and gas processing plant. According to the documents: “the loss of a Category 4 would present a severe impacts [sic] to the UK which for energy equates to a loss of electricity supply to >1 million for >18hours, loss of gas to >1million for >28 days, or loss of fuel >20% of national demand of up to one week”. Ineos also argued that its high levels of debt and the conditions attached to its loans meant that it could not afford to invest in the security measures. The refusal led to concerns that the whole Grangemouth complex could be at risk: “the vulnerability of Ineos refinery [sic] (which supplies steam and other utilities to the adjacent oil and gas processing plant at BP Kinneil) increases the risk of a successful terrorist attack against BP Kinneil which could impact oil and gas production through the Forties Pipeline System”. Howard Beckett, an assistant general secretary of Unite, which represents workers at Grangemouth, told the Sunday Herald that the union is not aware of any major work to improve security at Grangemouth since 2011. “It would be shocking if Ineos refused government requests to spend money on safeguarding such a vital part of our national infrastructure. Unite will be writing to Ineos to seek explanations but also to confirm we do not seek conflict and remain willing to work with them to manage all safety and security issues on site”, he added. Ineos’ rejection of the security service recommendations was an unprecedented move and led to confusion in Whitehall over how to deal with the company. Options for dealing with the situation were presented to energy minister Charles Hendry and included looking into whether the secretary of state could force Ineos to pay – DECC’s legal department concluded that he couldn’t. Officials liaised with their counterparts in Holyrood to explore whether a Scottish government grant that Ineos had applied for could be made contingent on funding the security measures. However, the government also looked at solutions that would accommodate the firm – including asking BP if it would pay and discussing with UK energy regulator Ofgem if the cost could be passed on to the public through a levy on energy bills. Despite behind the scenes efforts to find a way to force Ineos to pay, the documents reveal a more diplomatic approach to face-to-face discussions with the company. In a briefing for Moira Wallace, then permanent secretary at the department for energy, officials recommended that she raise the issue during her visit to Grangemouth – but that it “should be handled sensitively”. “Gordon Grant (Refinery Manager at Ineos Grangemouth) has made his position clear, in that if we (HMG & Scottish Government) consider there is a need to implement protective security measures (fences, CCTV and alarms) to mitigate the risk of a terrorist attack, then HMG and Scottish Government should pay. Mr Grant has made it clear that he does not have the budget and we do not believe he will appreciate being pushed hard on this point”. Wallace was however advised to stress the critical importance of the site to the UK’s energy needs and to remind Ineos that “CPNI advice and recommendations to improve security are not made lightly but based on extensive knowledge and experience. Implementation would significantly improve security at Grangemouth”. The documents further outline how officials were sympathetic with Ineos’ argument that its heavy levels of debt and the nature of its debt arrangements meant it could not invest in the security improvements. The company has been criticised for its tough approach to doing business, which has included moving its headquarters to Switzerland to avoid tax; shutting down its Grangemouth refinery in a dispute with trade unions; and lobbying then Chancellor of the Exchequer George Osborne to curb the rights of striking workers. The firm is now planning on moving back to the UK. Earlier this year an Unearthed investigation found that Ineos has threatened to take the National Trust to court to secure access to its land for shale gas exploration.